Nurie Hadi Shariff lives in Singapore and is a proud mother of 2 with a full time job and applies mehendi designs during her free time. Her interest in arts especially freehand art & doodling has been there since childhood but she developed serious interest in mehendi since the past 3 years. Read on to find out more. (In case if you’d like to see the other interviews with mehndi artists, click here, here,here, here,here,here, here and here). 1. Tell us about yourself – when did u begin applying mehendi designs and how did u think of getting into this line. My name is Nurie Hadi Shariff. A proud mother of 2 and married to Hadi Sufian, my loving & kind husband. I have a full time job and work as a mehendi artist during my free time. My interest in arts especially freehand art & doodling has been there since childhood but I only developed serious interest in mehendi since the past 3 years. Henna is so beautiful and magical. It is spectacular. 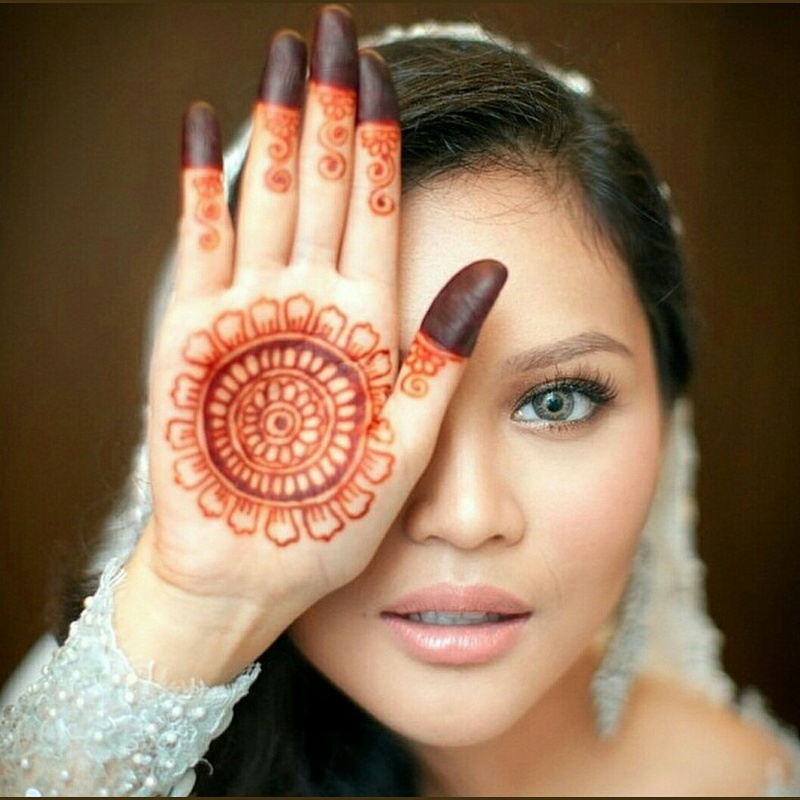 Henna is a popular adornment in my country, Singapore, and I believe worldwide too, especially amongst Muslim women, for casual & bridal purposes. There hasn’t been a day when I don’t doodle. It is THAT addictive! It has become a part of me and my lifestyle. My own hands are never blank as I wear my own drawings on regular basis. My company is named ‘Raeea’ as it means gorgeous in Arabic and that’s what henna is all about. 2. What are your top favorite mehendi designs? The top favorite design for me would be Arabic flowy floral ones and modern jewellery inspired designs. These designs exude elegance and femininity without looking too cluttered on the hands. The inspiration flows in effortlessly without much thinking or planning. 3. Most memorable experience you had while doing mehendi designs – something that has stayed close to your heart and is remembered very fondly. I have many memorable experiences. 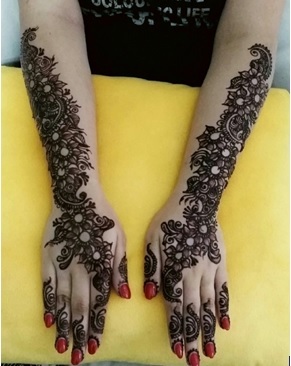 However, the most memorable one is when I see love for henna in my customers’ eyes, especially after they have got henna done. Nothing beats a beautifully captured picture of a bride wearing henna. Such moments are so close to my heart and I keep revisiting and cherishing them now and then. 4. What are your most important tips to take care of mehendi designs after applied? To ensure the process reaches the next level, henna aftercare becomes essential. The oxidizing stage takes about 48 hours (particularly for an extremely dark stain). To get a dark color, it is also important to use high quality henna powder and essential oils. Another factor is heat. In Singapore, the temperature is usually high and that’s great news! It is also a must to keep the mehendi on for 4-6 hours. Apply lemon-sugar sealant to ensure henna doesn’t crumble off easily. Lastly, avoid contact with water upon removal for the first 12 hours if possible. Contact us on Facebook or Instagram.